Last week in Chianti we were lucky enough to dine in style at Osteria Il Papavero in the hills above Gaiole in Chianti. We visited Il Papavero with our friends Dani and Olga two years ago and thoroughly enjoyed the food, wine and company and when we discussed a dinner venue this time there was no doubt – it was Il Papavero again. 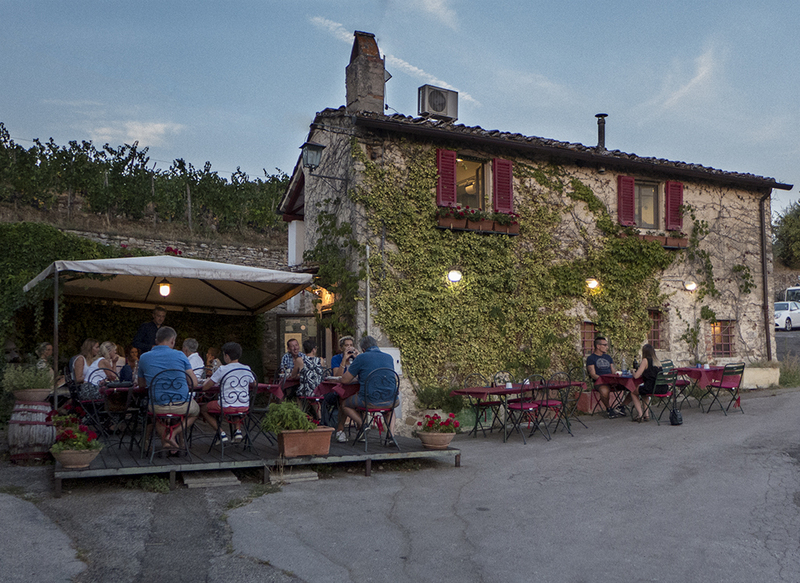 This is not a restaurant that gets “passing trade” as it is located in the hamlet of Barbischio – high in the hills above Gaiole in Chianti. The views are expansive and on a warm summers night there is seating inside and out. It helps that Dani and Olga are regular customers so we were greeted like locals. We discovered that following our last visit we had become part of Tuscan legend as one of our party (you know who you are Jean) was the only person who has ever ordered one of Papavero’s steaks “ben cotta” – well done. Two years after that, it was still remembered. Despite this we were allowed in and enjoyed a great night. The wonderful thing about Papavero is that their menu is supplemented by as many special dishes again, all produced using local produce that is seasonally available. So last night we had everything from anchovies and pesto through to Calamari shaped pasta with pork and olives. All washed down with fine wine and finished with a local digestivo. I see on TripAdvisor that Il Papavero has comments like “What a gem!“, “Amazing food and views ” and “Excellent Tuscan Dinner in Charming Setting“. We can only agree and are already looking forward to our next visit. Wine buffs will know we are staying in the Chianti Classico wine region. 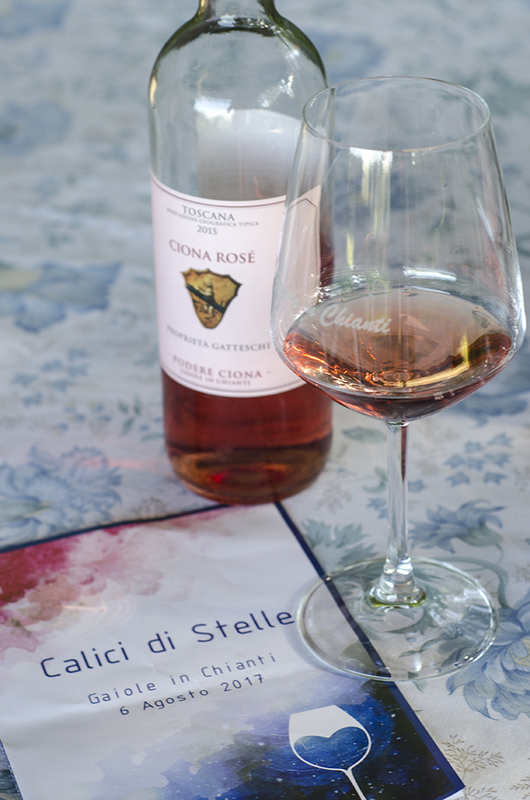 Within a few kilometres of our local town, Gaiole in Chianti, there are over a dozen producers ranging from the very large to the very small. 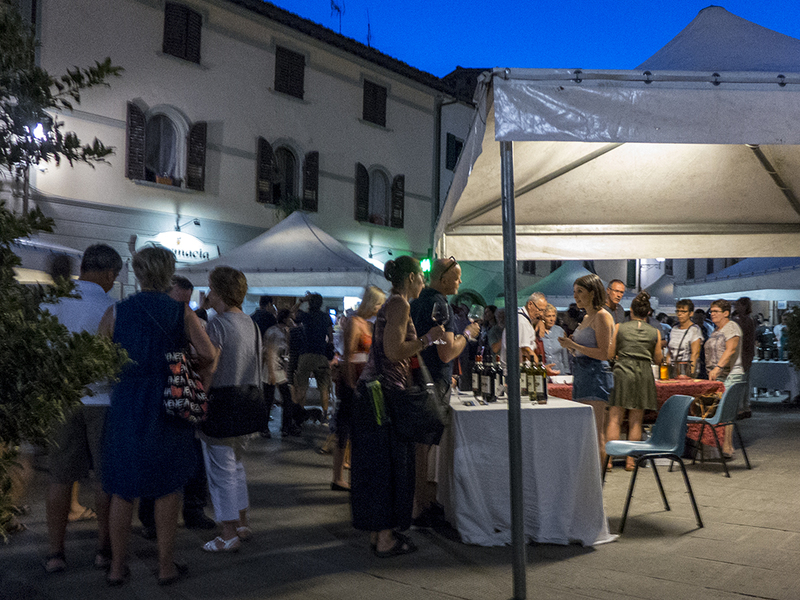 On Sunday night these local wine makers, together with the restaurants of Gaiole in Chianti got together and held a wine and food festival in Gaiole – Calici di Stelle. Loosely translated that means “Glasses of Stars”. For sampling were some fine Chianti Classico wines along with a range of other wines they produce. Our dear friend Olga was assisting with the Ciona winery stand (our villa Diaccino is on the Ciona estate) and invited us along. It was the perfect way to spend a Sunday evening. Starting at 8pm and running to midnight the event was a chance for locals (and visitors like us) to sample the local wines and try the local food. More than that, it was clearly a chance for families and friends to spend time together and catch up. We got to sample some very fine wines as well as chat with the wine makers. Dinner was in the form of beautiful Gnocchi, roast pork and various accompaniments. We had a great time but sadly the jet lag kicked in around 9:30pm so we had to leave early. 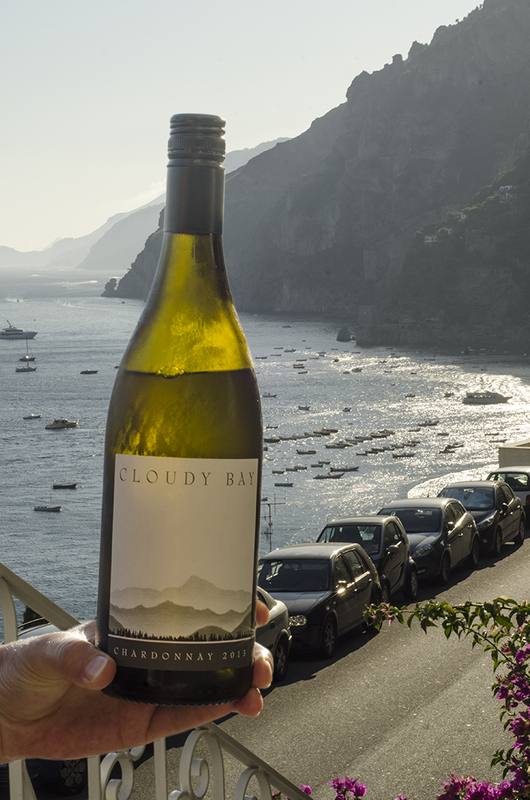 Italy produces some great wines some of which we’ve sampled over the last few weeks, but on this trip we couldn’t resist bringing a little bit of New Zealand to Positano. When we left the country we purchased, duty free, a couple of bottles of Jean’s favourite drop – Cloudy Bay’s iconic Chardonnay. So evenings on the verandah have been spent with the two of us and, when we felt like it, a friend from home. A friend is planning a trip to Epernay, in the heart of the champagne region, during the upcoming northern summer. This brought back memories of the time Jean and I spent in Epernay in the summer of 2007. We thoroughly enjoyed the experience, the cuisine and, of course, the champagne. Grapes from the champagne region are special. The region is located around 49˚ north of the equator which is as far north as grapes will ripen. And the grapes inherently have a high level of acidity – ideal for sparkling wines in general and champagne in particular. As a result the town is home to many famous champagne houses. We stayed at a boutique hotel just outside Epernay called Royal Champagne. Located on a hill over looking a valley filled with vines and with Epernay in the distance, it was the perfect spot to drink in the region. The hotel was originally a coach house on the main road running east from Paris. It has hosted, among others, the Emperor Napolean, hence the designation “Royal” Champagne which has stayed with the establishment ever since. It was a magical place with a superb restaurant and a bar where the Emperor himself could have enjoyed a drink. No trip to Epernay is complete without a tour of the cellars of at least one major champagne house. We chose Moët & Chandon who have 28 kms of cellars running under Epernay. And somewhere in that 28kms is their tasting room with a very fine selection of champagnes to savour. Most importantly the issue of pronunciation of the name is dealt with. The correct pronunciation is not “mo-way” but “mo-wett” or “m-wet“, as Claude Moët’s name is Dutch, not French. That’s worth a toast – a votre sante! One of the advantages of a long, hot and dry summer is that the country has many happy vintners. The 2013 vintage is shaping up as a cracker right across the country so if you’re a fan of New Zealand wine keep an eye out for some fabulous treats. At our place we share a very old vine with our neighbours. Over the years it has spread it’s way down the boundary fence and now covers about half the length bringing that Italian feel from our back yard right down to the front door. 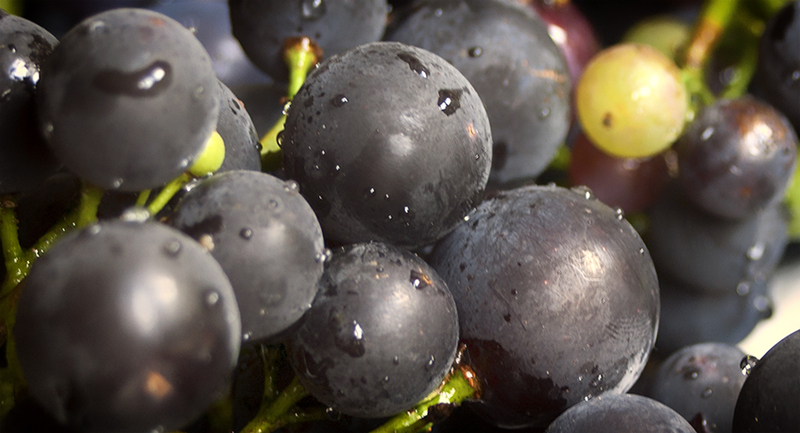 Every year it produces eating grapes and usually they are, how would you put it – sour, really sour. This year the long dry spell has been their saviour. Rich and sweet they have been a hit with our friends and rellies – so much so that friends planned a pick and run mission last weekend to clean out the last remaining bunches. As a result, our grapes may not be up for grabs this year but any bottle of wine from New Zealand with 2013 on the label will be worth grabbing – believe me. This time last year we had taken a break from the hectic pace of Tuscany, packed up the trusty Peugeot and headed north to France – the Cote d’Azur to be precise. We had arranged to swap cars in Nice returning a slightly beat up Peugeot 308SW and picking up a brand new shiny Renault Megane Estate. Jean’s sister, brother-in-law and their baby James had been staying in Nice for a week relaxing so we met them and then moved about 10 minutes along the coast to the small seaside village of Villefranche sur Mer. With bustling Nice on one side and glamorous Cap Ferrat on the other it always amazes me that this seaside village retains an air of calm and relaxation. There is nothing better than a quiet morning cafe at the hotel followed by a wander through the local markets and lunch on the Quai de l’Amiral Courbet with the sea lapping at your feet. The panorama shot (made up of 6 individual photos covering 180 degrees) is taken from our balcony at Hotel Welcome, an institution in the village and a place we’ve stayed every time we’ve visited – which must be half a dozen times in the last decade. The Hotel has a wonderful manager who speaks excellent english, has a wonderfully dry sense of humour, and is a keen rugby follower. Even in August last year he was picking a France versus All Blacks Rugby World Cup final and an All Black victory. An easy one was his pick.